Tourist visas the world over are seen as the basic and simple tourist visa. They are like the base model. The Vegemite sandwich of the visa world. Partner visas, skilled work visas, etc are the coq au vin and Duck à l’Orange. Just want a quick you-beaut visa to do the job? Tourist visa, mate! And yes, in many countries they are. You have the right passport and you arrive in the Philippines, instant stay for 30 days. After that, you go and get it extended. Pay the money. Rubber stamp! Australia has electronic lodgment these days. E-visas have existed for a long time for those low-risk countries, but these are the same tourist visas (for the higher-risk countries, Philippines included) that existed before. Still Subclass 600 Visitor Visas, and still with the same requirements to show a “genuine” reason to visit, and to convince them that you have no intentions to overstay. No rubber stamp. No “Easy Visas”. No mere formalities with Australia, sorry. Just remember that this is a country where good and stable jobs (ie. not 6 month contracts working for SM Mall) are hard to come by, and people work in awful places in the Middle East away from their families just to earn a little bit more than they could here. They would earn more as a cleaner or fruit picker in Australia than they would earn as a hospital surgeon here in Philippines! The temptation to overstay is pretty powerful! Is it easy to get an Australian Tourist Visa? Yet many assume that a tourist visa to Australia is really easy. When we used to take our applications directly into the old VIA Center (before the Embassy gave the “service delivery partner” job to VFS), you could see people filling out the forms right there and lodging them without any preparation at all, and these same people would wonder why their visa application was refused. Normally nothing terrible. They just didn’t manage to convince the Manila Embassy staff that their application was genuine and that they wouldn’t overstay. And you may read the DIBP (Department of Immigration and Border Protection) website and all those awful know-it-all visa advice forums until you are blue in the face without knowing how to best present your case. This takes knowledge and it takes experience, all of which Down Under Visa have. Those of you who have got Down Under Visa to prepare Australian tourist visa applications from Philippines to Australia for you will have certainly noticed that we expect some content from you, and we are sticklers for it being done correctly. Sufficient documentation and relationship evidence, and no omissions of information. Omissions and mistakes can and will be seen as false statements, and may lead to refusals now or even in the future. More reasons why these applications need to be prepared properly and with diligence. And a lack of evidence means that they may not see and understand your reasons for visiting, and may be doubtful that you will return at the end. It’s their job to see that only genuine applicants get visas, and that those who wish to break the rules and not comply with Australia’s migration laws will be kept out. We are talking about 40,000+ tourist visa applications every year just through Manila alone. If they were relaxed, comfortable and prepared to give the benefit of the doubt to poorly prepared applications, think of the end result?! So, if you think it’s all very easy, we ask you to think again. If your mate slapped and application together and managed to get it granted, he was lucky. See if the mate can keep doing that hundreds of times every years just like we do, and see what happens? 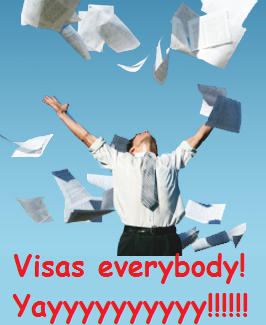 When you come to Down Under Visa for help, you will get our very best attention and our dedication to do everything we can (legally and ethically, of course) to get your application granted if the applicant and your circumstances appear to match what the Migration Regulations set out for a tourist visa. We hope you will follow our advice and our instructions, and we look forward to being able to give you the good news at the end.